A coyote looks like a wolf, but in fact both wolves and coyotes have many differences between them. Sometimes coyotes are referred to as ‘barking dogs’ and belong to the dog family. Red wolves are the species which resemble coyotes the most. Unlike a wolf, a coyote has a bushy, thick tail, which it holds low to the ground. Wolves generally have gray, black, or white fur and are bigger in size than the coyotes. When an adult coyote weighs around 10 kg, a wolf can be around 25 kg. The legs of a coyote are visibly thinner than those of a wolf. Coyotes are mostly found in the southern, central, and western Canada. Wolves can be found in Alaska, Northern US, Labrador, and the Yukon territories. Coyotes are generally considered shy and non-confrontational and their main foods are smaller animals like mice and rabbits, certain vegetation, and carrion. They often hunt in pairs and prey on animals like deer when together. Wolves, on the other hand, prey on larger animals like goat, sheep, and moose and hunt in packs. They use the method of scent marking to determine their territories and track down preys. Sometimes coyotes can be found in the less human inhabited places, but usually do not cause any harm to the residents there. In fact coyotes are helpful to human beings to an extent. They prey on the small rodents, which destroy cultivation. These animals are often considered intelligent and adaptable. However it can attack and feed on your poultry and pet birds, if left unnoticed. To keep these animals away from your pets, you can use bright flashlights, make loud noises to scare them away, and keep your pets in safe cages or fences. Wolves also are secretive and run on seeing people. To keep wolves away from your surroundings, always maintain clean and secure surroundings. However, coyotes are considered to be more adaptable to humans than wolves. They usually do not attack humans owing to their small sizes and shy behavior. Wolves howl to communicate with the other members of the pack and other packs. They also howl to attract mates, when they wake up, and when they sense any danger. The howls or barks of coyotes are high pitched and are long rising and falling notes. People refer to the calls of coyotes as yips and yelps. 1. Wolves are larger than coyotes. 2. Coyotes have bushy tails than wolves, and often hold it low to the ground. 3. Wolves hunt in packs, while coyotes hunt primarily in pairs. 4. Coyotes are more adaptable to human beings than wolves. 5. A wolf’s calls is termed as howls, while that of coyotes are termed as howl, yelps, and yips depending on the rise and fall of the note. Manisha Kumar. "Difference Between Coyote and Wolf." DifferenceBetween.net. June 21, 2018 < http://www.differencebetween.net/science/nature/difference-between-coyote-and-wolf/ >. While there are obvious differences between wolves and coyotes, those differences seem to pale by comparison between various breeds of dog. Since all three can interbreed and produce fertile offspring they would seem to have much more in common than that which separates them. The question that interests me is the degree to which coyotes have contributed their genetics to domestic dog breeds. One reads that all dogs are descendants of the wolf but why isn’t it likely that coyotes DNA too is present in some dogs? 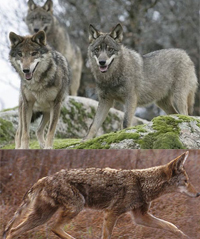 Coyotes cannot interbreed with wolves and domestic dogs, they are from a different lineage. Coyote/dog crossbreeding is not only possible, it is fairly common in the wild. Coyote/dog crosses tend to be more aggressive and less wary of humans. Says who?? I used to own a domesticated coyote/shepherd mix, as verified by a veterinarian. We have hybrids in Canada that have been confirmed as being Wolf and coyote and dog lineage. Not sure where you got your information from but it is not correct. Though coyotes are becoming even bolder now! I live in the woods and hills of Indiana and they were in my backyard in broad daylight today, eyeing my small dog!!! They were in a pair and extremely close to the house. We made loud noises and yelled at them but only when our other 2 dogs started barking and came running did the coyotes go away. the wolf and the coyote have a lot of differences.Coyotes are quicker not faster,theyre more clever to.Wolves are a different story,faster,stronger,more aggressive.But who wastes more energy on the hunt?answer:wolves I know what you are thinking no way but its true.Coyotes dont stop stop but every 48hours coyotes dont have territory cause they never stay in an area like 10000acres they dont stop they keep going.Wolves they mark(urinate)theyre territory they in one area when they kill an animal they stop and eat it.Coyotes dont when they kill theyll eat it it when theyre walking.who cares about theyre pups more?actually equal because its the mommas instinct even if it means going up against 20 elephants. trust me everything on here is true. Actually, because coyotes are solitary and more habituated to humans, they have more opportunity and are more likely to attack. Seriously, in terms of danger to humans, feral dogs and pet dogs are both much worse than either wolves or coyotes, but there have been documented coyote attacks on humans in the lower 48…but not wolves. Yes, considering the wolf has become way less prominent than coyotes. I just watched a documentary about coyotes killing a young woman in Cape Britain. Coyotes run more from place to place and waste less energy ?…do you digest what you say ?.Wolves are smarter and have a bigger brain..reason for why they are better organized…coyotes smarter than wolves…yeah right…and dogs howl instead of barking.You people should document yourselves better and don”t use your impulses or false myths to drive your judgment.Wolves tend to be distant towards humans,and I know this because I saw it which show alot of control while they are quite powerfull if well fed.And coyotes are those who are more bolder than wolves and wolves barely prezent a threat to livestock because they attack it(again they are distant towards humans) if certain idiots killed all good wildlife in their hunting grounds.They pretty much blame wolves for the actions of coyotes.Since little I”ve morely had problems with dogs or wild dogs and not wolves…they may be the most clever and and strong and the most organized canines but since they have no reason mostly to hunt humans they don”t..they simply keep a distance or just run.But they do freaking attack you if you persist on running after them with dogs. This article needs to be revised. I lived in a very populated area of Los Angeles in the late 1980’s and coyote sightings, as well as attacks on household pets, were commonplace even then. I lost a cat to a coyote in the middle of Glendale in 1987, long before the internet (and hence this article) was widely available. Even the range listed for Coyotes is incorrect, confining coyotes to Canada and wolves only in the northern parts of the US. “Coyotes are originally residents of middle America, particularly between the Rocky Mountains and the Mississippi River, as well as parts of Canada and Mexico. I am a former SoCal resident. I lived in the Whittier/La Habra area throughout my childhood. Even during the 70’s & 80’s one had to be cautious of Coyotes, during late night hours. It’s really common knowledge. After spending 5 years in the Marines, I migrated to Scandinavia. I’ve been here for 19 years. Here in Scandinavia, wolves have been known to take dogs, pets and attack small children. The sometimes bold wolves, remind me of the SoCal mountain lions mentality. Admittedly, these attacks are rare, in contrast to wolf numbers. You’re more likely to be attacked by a Russian. Anyway, bold wolves are usually hunted and killed.